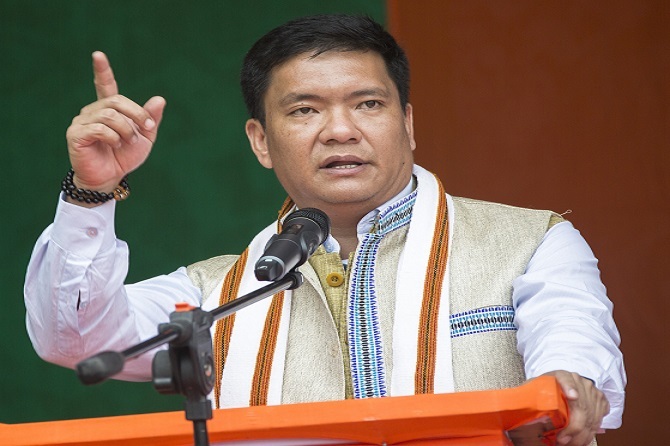 Arunachal Pradesh CM Pema Khandu said he is against the trend of candidates being elected unopposed in parliamentary or assembly elections asserting that such culture is against the democratic spirit. Arunachal Pradesh Chief Minister Pema Khanduon Tuesdaysaid he is against the trend of candidates being elected unopposed in parliamentary or assembly elections asserting that such culture is against the democratic spirit. Khandu was speaking at the concluding session of the 3-day Yuva Sammelan organized by the state unit of the Bharatiya Janata Yuva Morcha (BJYM). Referring to previous 2014 elections when 11 MLA candidates from Arunachal were elected unopposed, the chief minister said that such trend must stop and called for elections instead of direct nominations in every constituency with full democratic process. “We will not go appeasing the opposing candidates to back down with lure of schemes or plump posts in the government, he said and even called for elections in his home Jang-Mukto constituency that has witnessed uncontested elections since the last fifteen years. Khandu said that such appeasement is the cause for corruption and continuing with such practice holds no meaning being in BJP, which is a party with difference. “It’s time to build new Arunachal and under BJP we must achieve it in line with Prime Minister Narendra Modi’s vision for New India by 2022,” he said. Calling for uprooting money culture in elections, the chief minister urged for ‘Jan Andolan’ involving every religious body, community organisations, political parties. He also called for strict monitoring of electioneering by the Election Commission. Lauding the leadership of Prime Minister Modi, Khandu said the PM has initiated such development projects, which was unthinkable earlier such as “Railway lines to Tawang and along the foothills of Arunachal”. He also credited the PM with completion of all pending projects in the Northeast initiated by the previous Congress government. “Had Modi been a prime minister 15 years ago, the development scenario of the Northeast would have been completely different,” Khandu asserted and rued that Congress didn’t even had the will to complete the project that it had initiated. Exhorting on party ideology, the chief minister called for party workers to rise above individual following and to adopt politics based on party ideology. “Our loyalty must lay with party rather than favouring a certain leader or an individual,” he said. He also called for adopting the BJP’s development mantra of ‘Sabka Saath Sabka Vikas’ to reform the existing system that favours only the rich and powerful. He said reforms must be initiated when we have the willpower to do so, else time will come when we might have the will but no power to act. Earlier RWD minister Bamang Felix and state BJP president Tapir Gao also spoke. The dignitaries present also offered shraddanjali to late Pandit Deendayal Upadhyaya on his birth anniversary. On the occasion, the chief minister handed out tug-of-war winner trophy to Lower Siang and Kurung Kumey team in the girls and boys category respectively. He also gave away the winner’s trophy to cultural team from Anjaw for their best performances in the cultural items.